Thankfully Jo Neller could let me stay another day in Erina, as I had a little problem in getting to a next place to stay. The morning began early, when Jo woke me up at 6.30am. I had a quick shower and joined Jo for a quick cereal breakfast. 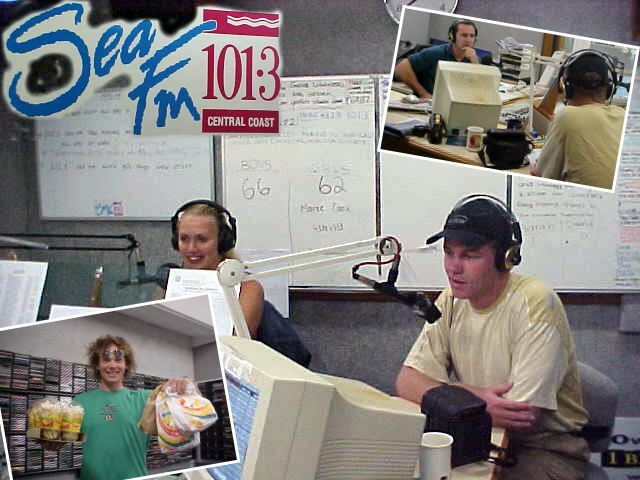 We had to hurry to get on time to our appointment at the radio studio of SeaFM, the Central Coast radiostation. At the studios the morning deejays Paddy & Sarah had a chat with me, broadcasting some audio fragments of the A Current Affair item about me, that was on TV last week. They were very excited to have us over as a guest and even arranged a free McDonalds� breakfast for Jo and me. Tomorrow they are going to contact me again and help me get a lift to my next place. After the show, Jo brought me back to her home and gave me fifteen dollars and the key of the house. As she went to her work, I dove back in bed for another few hours of sleep and worked on my reports on my laptop later. The weather was terrible hot. It started with 30 degrees at 11 o�clock and the temperature increased to 38 degrees. It was a few days later that I heard that today was the hottest day of the year already! Even the summer days weren�t this hot. You understand that I preferred to relax at home, with the air-conditioning on maximum. I worked on my invites on the Central Coast area and dotted my map again. In the afternoon I dared to go out and had a walk on The Entrance Road (the main road that goes through Erina and end up in a town called The Entrance). I walked up and down and passed little shopping malls, very American-looking, with big furniture shops, big car garages, and big hardware stores. At the Fountain Plaza I rented a video with the money that Jo Neller gave me. She had also provided me her videostore memberscard. At home I first took a dive in the backyard pool and watched the oldie video Mercury Rising with Bruce Willis. Jo returned from her work in Sydney around 6pm and we both got ready to eat out again. This time not in a restaurant, but at Jo�s friend Graham�s place. Graham used to be the former boss of Jo, when she was in the education industry. We had a good veggie dinner on the veranda and other friends Steve and Graham�s brother Dave joined in. After the after-dinner wine, we got back home. Jo was pretty tired, partly because of her workday and partly because of today�s hot weather. Someway I hadn�t really been very active today either, but I went to bed with a tired body also. One way or another I still have to get used to the hot weather, as it will be getting much warmer as I move even further north, people told me.